This is a very old fashioned appetizer but recently it has been making a come-back. My wife made three different flavors; the one with parsley (back) is classic mayo and mustard flavor, the one with slices of conichon pickle (middle) is curry flavored and the one with red sauce (front) is flavored with Sriracha hot sauce. 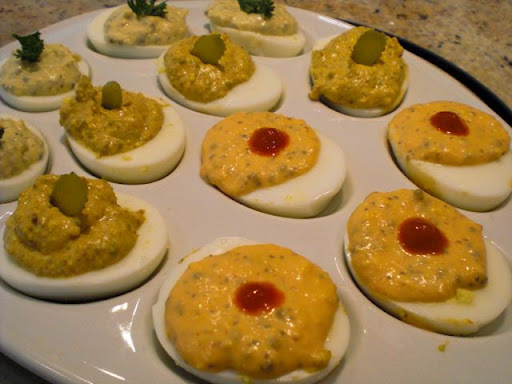 Sometime ago, our dear friend who was in her late 70s served us deviled eggs as an appetizer. We really liked them and thought about making some ourselves. A few months later, my wife found a “deviled egg serving plate” (#5 in the image below) and bought it. But the plate sat unused in the cabinet for several years. 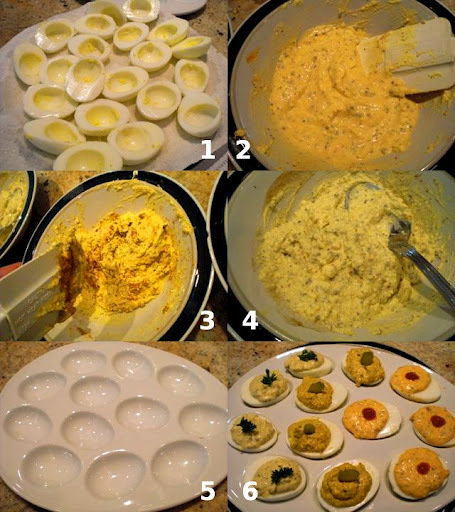 One weekend, my wife, out of the blue, suggested making deviled eggs. She must have had some train of thought leading up to the idea but, from my vantage point, her statement came completely out of the blue. Since this is a perfect drinking snack and Japanese really like eggs, I thought this could be the next new craze in Izakaya cuisine (probably not). My only task for this dish was making perfect hard-boiled eggs. I do not like overcooked eggs—you know the kind; the ones with the green surface on the yolks (ferrous sulfide forming at the interface between the yolk and white). This is how I make hard boiled or, as I prefer to say, completely cooked boiled eggs. I took the eggs (1 dozen) from the refrigerator 30 minutes before cooking. I punched a pinhole in the air cell side (rounder end) using an egg piercer (to prevent the eggs from cracking when the air inside expands during cooking). I brought the water to a rapid boil and turned down the flame until no bubbles were coming up. I added the eggs using a perforated spoon. In the first few minutes, I gently stirred the eggs hoping that this would help the egg yolks center inside the shell as they cooked but I am not sure this really helps. I let them cook for 15 minutes and immediately cooled them down in cold running water. I peeled the eggs and turned the operation over to my wife. She made three different filings; 1. classic mayo and mustard seeds (#2 in the image below), 2. curry flavor (#3 in the image below), and 3. with hot sauce ($4 in the image below). I removed the yolks from the whites. The shells formed by the cooked eggs whites are shown in picture 1. I gently mashed the egg yolks with a fork until they became uniformly granular. All the flavors started with the same base. I added a mixture of half mayonnaise and yogurt to the crumbled yolks. In this case I used about 3 tbs. mayonnaise and 3 tbs. yogurt. I cut the mayo with the yogurt in an effort to be health conscience…which may not make too much sense given that we are flavoring egg yolks here. Even with the addition of the yogurt, however, the overall mixture still tastes like mayonnaise. I bloomed 1 tbs. of mustard seed (bloom by putting the seeds in a dry pan and heat until the seeds start popping like popcorn). I added 1 tsp. of celery seed, 1tbs. of Dijon mustard. and 1/2 tsp of salt. I stirred the mixture until it formed a homogeneous paste. I divided the mixture into 3 equal parts. Traditional: I added 1/4 tsp of onion salt and 1 tbs. of Worcestershire sauce. Curry flavor: I added 2 tsp. of curry powder (I used a mild slightly sweet powder but whatever powder you prefer will do and added to your taste), I also added another tsp of Dijon mustard. Hot sauce flavor: I added 1 tsp. of rice vinegar, 1/4 tsp. Sriracha hot sauce, 1/4 tsp. onion salt. I mixed each flavor until the added ingredients were completely incorporated. I lightly salted the empty egg white shells and then spooned in the flavored mixtures—one flavor per shell. Then I turned the operation back over to my husband who immediately garnished them making them look pretty for their photo shoot. So how decadent was this? Eating just one flavor per sitting was out of the question. All three were very good and provided interesting variety. My wife liked the curry flavor and I liked the one with hot sauce. The bloomed mustard seeds really added to the eggs by providing a pleasing texture and a little burst of flavor (they pop when you bite down on them). This dish goes with any drink. The only problem is that even with the addition of yogurt this dish is high in cholesterol.